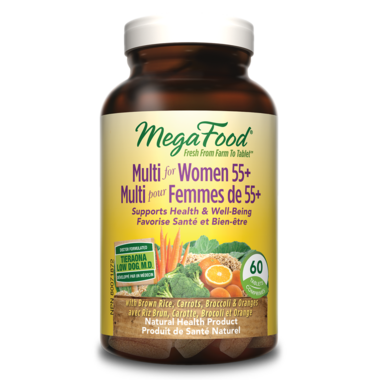 MegaFood Multi for Women 55+ is nourishment in a convenient two tablet daily formula that supports health and well-being of women over the age of 55. Dosage: Take 2 tablets once a day. Take with food a few hours before or after taking other medications. Ingredients: Vitamin A (beta carotene in carrot ) 1750 IU, Vitamin D3 (cholecalciferol in S. cerevisiae) 500 IU, Vitamin E (mixed tocopherols [sunflower] in organic brown rice) 11 IU, Choline (choline bitartrate ) 100 mg, Vitamin C (ascorbic acid in organic orange) 50 mg, Niacin 10 mg, Zinc (rice amino acid chelate) 7.5 mg, Pantothenic Acid (calcium pantothenate in organic brown rice) 4 mg, Vitamin B6 (P5P in organic brown rice 3 mg, Vitamin B2 (riboflavin 5'-phosphate sodium in organic brown rice) 2.5 mg, Potassium (mineral bound S. cerevisiae) 1.5 mg, Vitamin B1 (thiamine HCl in S. cerevisiae) 1 mg, Manganese (mineral bound S. cerevisiae) 500 mcg, Biotin (in organic brown rice) 150 mcg, Folate (5-MTHF in broccoli ) 100 mcg, Copper / Cuivre (mineral bound S. cerevisiae) 75 mcg, Chromium (mineral bound S. cerevisiae) 60 mcg, Molybdenum (mineral bound S. cerevisiae ) 30 mcg, Iodine (mineral bound S. cerevisiae ). 25 mcg, Selenium (mineral bound S. cerevisiae) 25 mcg, Vitamin B12 10 mcg, Green Tea Leaf Extract 125 mg. Non-medicinal ingredients: Cellulose (protective coating), Silica, Stearic Acid.